The truth is sometimes we don't know how good the good times were until they are long gone. Toys are outgrown. Clothing goes out of style. Kitchen gadgets become obsolete. Then one day we see these same items years later at a flea market, and all of a sudden they seem almost irresistible. "My Grandmother had one of these!" or " My Mom had one of those!" are words I hear at flea markets all the time. Usually the items in question trigger memories of holidays, meals, traditions and lots of everyday activities that now seem quite special. I, like many, take it one step further. I am actually sentimental about times in which I was not even a gleam in my Mother's eye. I love early 20th-Century design. In fact most things I purchase at flea markets date from the early 1900s through 1950. I find that comfort, nostalgia, history and great design are all common denominators for me when it comes many of these objects. In fact, each trip to a flea market is a bit of a sentimental journey for me. I love discovering objects like those that once had a place in a family member's home. For me, it's mostly items that remind me of my Grandmother. She was an interior designer and seamstress who taught me more about the business than anyone. She was also practical, thrifty and spiritual. And she had great taste. 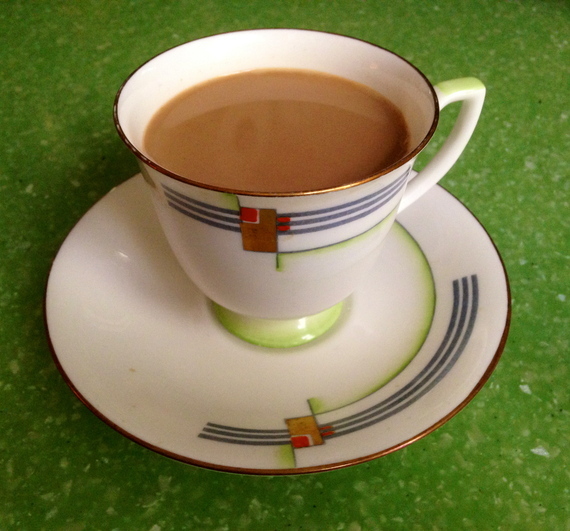 My Grandmother gave me many of her much-loved items when she was still alive and I live with them today. Often I'll find things to add to my collections that belonged to someone else's grandparents, but could have just as easily been in my Grandmother's home. The one rule I'm steadfast about when it comes to flea market shopping is a simple one: "Buy What You Love." For me, those objects are often ones that for some reason remind me of visits to my Grandmother's home or the home of friends who were around her age. People in her generation set their tables and used real china. They dressed to travel and bought items they held onto for years. Those are all qualities I'd like to keep alive. One day about 10 years ago, I was helping my Grandmother clean out a cupboard and I asked her if I could have a tin with powdered hat cleaner in it. I loved the graphics, the font and the colors. It appealed to me on many levels. The date on the can was 1932. My grandmother smiled and said, "If I give that to you, what am I going to use to clean my hat?" The kick in the pants was that she wasn't kidding. She still used the powder a few times a year if one of her hats had a stain on it. Eventually she gave it to me, and now it's a sweet tangible memory of her. In fact, it's probably why one of the many interests I have in collecting includes old tins and boxes. In fact, just last week I went to an estate sale in rural Montana, and the item I purchased that I love the most is a WWI tin of button polish for a soldier's uniform. It's called "The Soldier's Friend," and I think it is very cool and charming. I love that it survived all these years. Now it's on a shelf in my dining room and I recall the fun time I had weeding through the estate and also wonder about how many buttons were polished with the contents. It is a tangible piece of history, and something that's now considered obsolete -- and those ingredients, for me, make the perfect find. Like most people who frequent flea markets, I have my favorite dealers, and they are usually those who have a certain vibe in their booths. It's part nostalgia, part humor and part iconic style. I always say that a good antiques dealer is also a historian, a curator and a matchmaker. 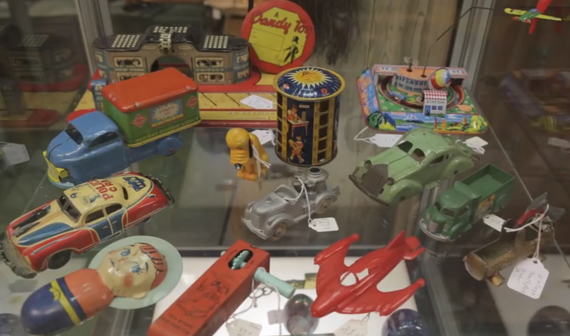 In addition, the "Sentimentality of Stuff" is a part of what flea markets and antiques shops are all about. In fact, I'd go so far as to say that most people who orbit the antiques world are largely sentimental people, and I, for one, wear that badge with honor. 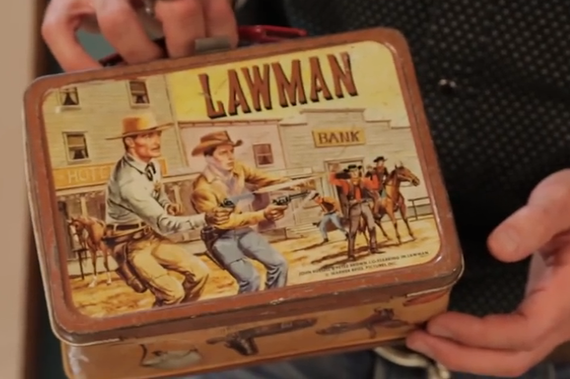 Objects from the past have a story, and have often had many lives. That fact alone makes flea markets endlessly interesting to me. I love imagining how an item was used, and I love the idea of giving that same object a new incarnation. Repurposing is not a new concept. 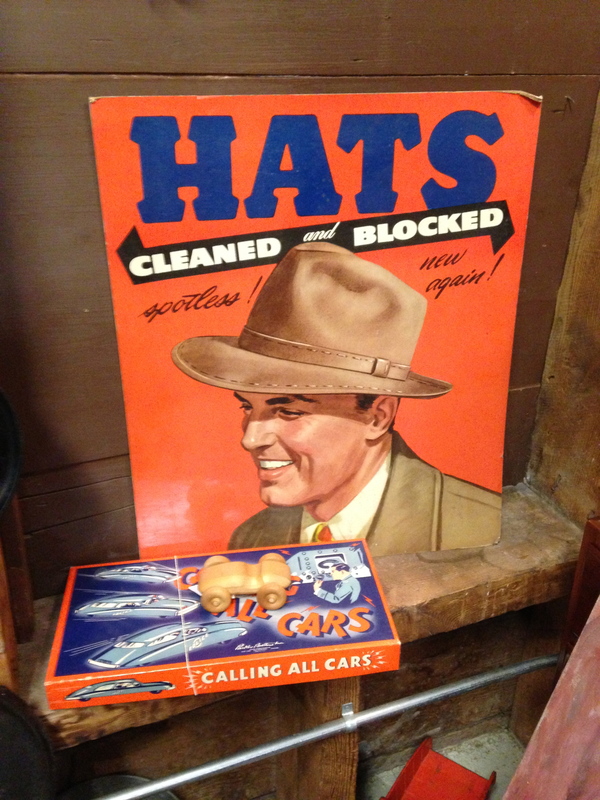 In fact, some of my favorite flea market finds are items people made or changed in some way to suit their needs. An old can that once held white corn was made into a bank. Orange crates and clothespins became dollhouses and the dolls that lived in them. Old feed sacks became quilts. The list goes on and on. Suffice to say that these are often things that really pique my interest at flea markets. 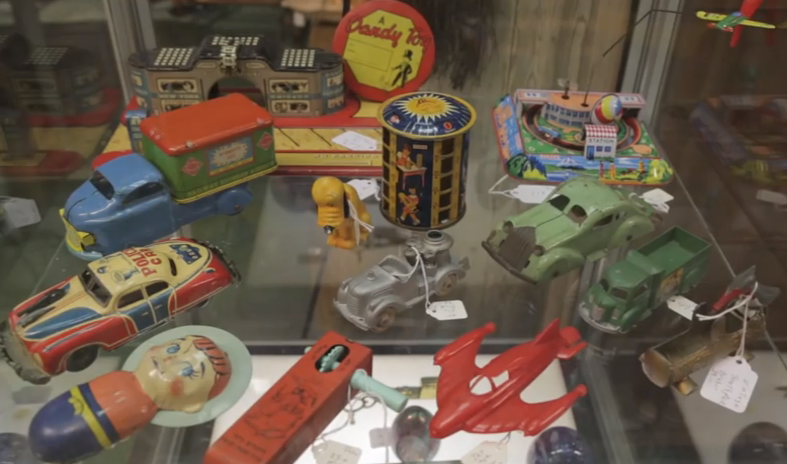 Every few months we hear a story about someone who bought an object at a flea market or second hand store and then discovered it was worth a million dollars. Of course that's a dream all of us have, but those cases are few and far between. For those of us who buy vintage and antiques for clients, of course making a profit is all part of the deal. So I always look for bargains at flea markets when I can find them. Also, often when I visit friends they pull out an item and ask me its value. When they do, they are referring to its financial value on the market today. I often have to let them down easily by saying something like, "Because it belonged to your Aunt, it's very valuable to your family history, and it is a lovely thing you should enjoy. But it would probably sell for about $10 on the retail market." People are often let down and surprised at this, but the truth is that most of what's out there isn't enormously valuable in terms of finances, but it does have very real value to that person. I like to underscore that. My friend Mary understands this. She has a pink and gold glass that used to be part of a set that belonged to her Grandfather. Now she's got it in her bathroom holding her toothbrush. It looks great and is very meaningful and valuable to her. Just like my Grandmother's tin of hat cleaning solution. That said, when I buy items for myself, I really follow that 'buy what you love' rule I mentioned earlier. If I live with it and love it, and it moves me in some way or stirs a memory, then it was a good purchase. I feel this way about vintage Christmas ornaments. They open up a world of memories and good feelings, and I have now turned those emotions in to a very large collection. I believe that objects not only spark emotions, but they also open up new worlds. One of those worlds is one of historical significance. I find that objects often teach me about a time in history or spark my interest in learning more about a region, a person or an artistic movement. And all of that is pretty priceless. One of my favorite things to collect is WWII memorabilia. I love the propaganda posters, the books of ration stamps and the items that speak to our country's united efforts to win the war. As I began collecting these items, I learned more about our country and about that time in history. While I wasn't alive during that time, my Grandmother was, so I'd then ask her questions based on my purchases. I learned about Victory Gardens and Tire Drives. I also learned about something called "Sweetheart Jewelry," which was made especially for those to wear on the home front to show their support to their loved one in active duty. 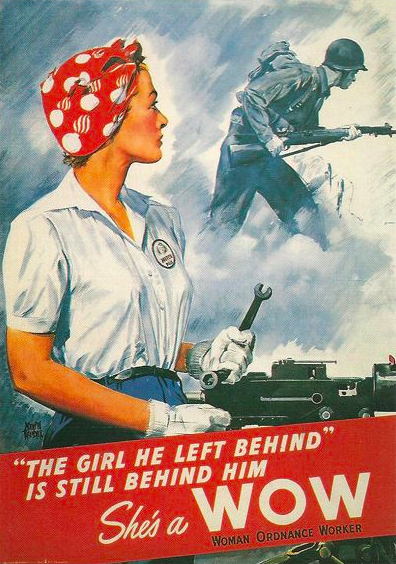 A WWII Poster Promoting the "Wows"
Often I've also found photos of places I've been that were taken long before my feet touched that same soil. It makes me curious about how the area evolved and what businesses were typical at the time the photo was taken. I also love automotive items that speak to how people's lives changed once they had a car. 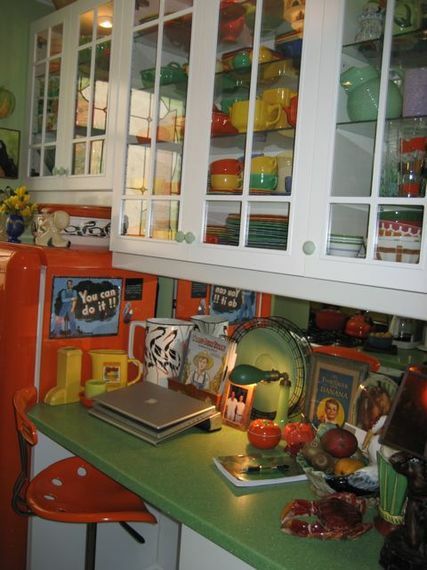 And another area that interests me is what I like to call kitchenalia -- or items that were found in the kitchen. Many speak to people making do with what they had and reusing items they brought into their homes. Those examples run the gamut from recipe books that talk about how to 'stretch' ingredients to holders for string that was wrapped around a box, and could now be used for a variety of household purposes. 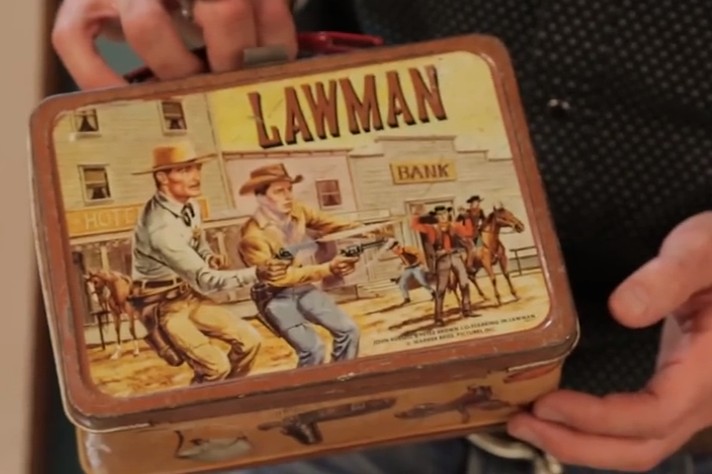 A Vintage Lunchbox Depicting a Scene from "The Lawman"
While I'm out about my sentimentality in relationship to flea markets and home décor, I do think it's possible to enjoy all of these items and still live in the now. The best way I know how to do this is to decorate by mixing periods, which feels very current and comfortable. Good design never goes out of style, and a Mod 1960s lamp can easily coexist with an early 1900s farm table. It's all about color, form and imagination. In fact, I think bringing antiques and vintage items into your home and mixing them with new items is just about the most contemporary thing you can do. It's kind of like a perfect storm of history, design and innovation. Living with items from the past doesn't mean having to have a home that looks like your Grandmother lives there -- but it might be nice if it felt like she visited once and awhile.